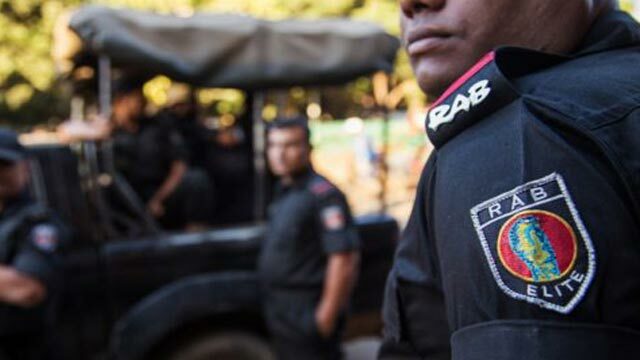 Chapainawabganj, Sep 7 (Just News): A suspected drug trader was killed in a reported gunfight between his cohorts and Rapid Action Battalion (Rab) at Nayadiari in Gomostapur upazila of Chapainawabganj early today. The deceased was identified as Abul Hossain Babu, 35, son of Alam of Shibrampur village in the upazila. Tipped off that a group of 'drug traders' gathered at a mango orchard for 'drug dealing', a team of Rab-5 conducted a drive there around 1 am, said sources at Rab. Sensing presence of the elite force, the 'drug pedllers' opened fire on the Rab members, forcing them to fire back. After a brief gunfight, the Rab members recovered Babu with bullet wounds and took him to the upazila health complex where doctors declared him brought dead. Two Rab members were injured in the incident. One pistol, three bullets, one magazine and 177 bottles were recovered from the spot.